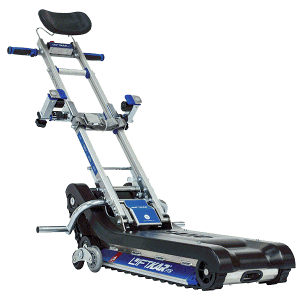 Powered Stair Climbers take the hard work out of transporting a wheelchair user up and down the stairs. The really do the hard work for you in an extremely safe and convenient way. Evacusafe offers a range to suit different requirements, all of which can be seen below. There are many reasons why somebody cannot manage stairs alone for a short period of time, or perhaps permanently. 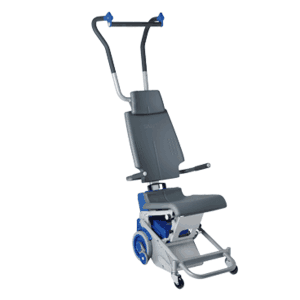 For people who need assistance, powered stairclimbers are easy to use, safe and can be operated without excessive effort. Basement, ground floor, first floor, garden – powered stairclimbers from Evacusafe can get your whole house back. Plus, the everyday things such as going to the doctor’s or post office, visiting friends and relatives, travelling by plane or train, going to the theatre or an exhibition – everything becomes much easier again. You can view a summary of other evacuation equipment options, and the range of services we have available, on our homepage. 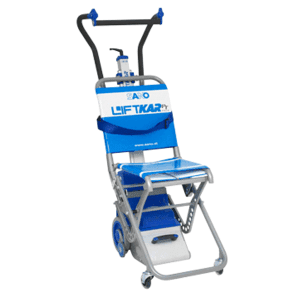 This is our current range of stairclimbers, please click the images to get more information on any of the models. These are the best prices available as of 20th April 2019.